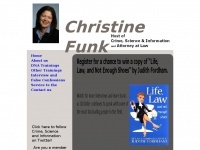 Christine Funk is a criminal defense attorney with extensive experience in forensic science. She represents defendants in criminal cases throughout Minnesota. The websites creator or author is Christine Funk. The web server used by Christinefunk.net is run by GoDaddy.com, LLC and is located in Scottsdale, USA. There are many websites run by this web server. The operator uses this server for many hosting clients. In total there are at least 15,671 websites on this server. The language of these websites is mostly english. Only a few websites on this web server are x-rated.